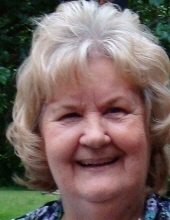 Evelyn Harriett Fortner of Scottdale, Georgia, passed away peacefully on Sunday, February 3rd, 2019. She is survived by her daughters Debbie Beagle and Kim Jannakos, and her son-in-law, Ted Jannakos; as well as her five grandchildren: Alexandria Coppedge, Abbigale Coppedge, Johnny Beagle, Alyssa Jannakos, and Andrew Jannakos, and her great-grandson Anthony Mac (punkin). She has one brother, the Rev. Timothy Fortner, his wife Anna, and two nephews: Dan Fortner, wife Rochelle and their children, Sara Ryann, Colin MacDaniel and Finian, and Matthew Fortner, wife Jenny and their boys, Noah, Jacq, Owen and Henry. A Celebration of Life and Witness to the Resurrection Memorial Service will be held on Saturday, February 9th, 2019 at 4:00 PM at A.S. Turner Funeral Home in Decatur, GA with family receiving visitors at 3:00 PM prior to the service. Harriett was born on July 29, 1938, to Evelyn and Horace Fortner in Atlanta, GA and was raised in Scottdale along with her brother Tim. She attended Scottdale Elementary and graduated from Avondale High School. She married Billy West at a very young age, and they raised their two daughters Kim and Debbie in Tucker, GA. She began her career as a floral designer at Emory University Forist at the age of 16, and she was honored with a Designer of the Year award as an up-and- coming designer in Atlanta. She worked there for 10 years until her daughters were born. After the children started school, she returned to the floral business and worked for Tucker Flower Shop. Harriett worked at several area florists including Stone Mountain Village Florist, Halls Florist in Stone Mountain, and then became the owner of Mountain Park Florist. Later, she managed A Bokay by JoAnn flower shop, and she worked their until she retired. Harriett enjoyed being active and her favorite things in life were riding her beautiful buckskin horse, “Lady”, climbing trees, romping through the woods, and playing with cousins and friends. She loved her Mother and Daddy so much and enjoyed doing everything that her Daddy did. She enjoyed spending time with him as an outdoorsman; shooting guns, doing yardwork and helping in his garden. She enjoyed sitting in the swing and rocking on front porch with her mother. She enjoyed gardening, floral designing, decorating trees at Callenwolde Fine Arts Center at Christmas and decorating her home for Christmas. She loved her 1977 triple black Grand Prix and enjoyed cruising the roads at Stone Mountain Park. Her favorite music included the Eagles, Heart, Fleetwood Mac, Pink Floyd, Styx, Elvis, Willy Nelson, and Jim Reeves. She was a devoted Mom, dedicating every free moment to making sure her girls enjoyed their lives; Beach trips, going to the lake at Stone Mountain Park and just spending fun times with them. Kim and Debbie grew up, were married and gave herfive wonderful grandchildren. They filled her heart and life with so much joy! The children spent a lot of time at Meme's and Granny's house, spend the night parties on the weekends, playing in that beautiful yard, Easter egg hunts, taking walks around the block, going to look at the live lobsters at the Farmers Market and just enjoying life with her! The special times, holidays, decorating for Christmas and Thanksgiving dinners were some of the best memories we will all Cherish. Her favorite song was “Take It to the Llimit” by The Eagles. She lived a lifetime of limitless love and enjoyed every moment and she did "Take It to the Limit!" We will all miss her dearly, every day, but will see her again when we all get to Heaven! What a day of rejoicing that will be💖 Rest Easy Sweetheart! All of you know that Harriett loved her flowers. Flowers are certainly welcomed. JoAnn Morgan (long- time friend and owner of A Bokay by JoAnn) is handling the floral arrangements for the service. Please feel free to contact her if you would like to send any floral arrangement, and she will make a recommendation. Her number is (770) 491-6049. Flowers will be lovingly accepted, however if you would rather make a donation in her memory, please do so to Emory Winship Cancer Center at the Emory University Campus. There is a link below to donate. To send flowers or a remembrance gift to the family of Harriett "Pinky" Fortner, please visit our Tribute Store. "Email Address" would like to share the life celebration of Harriett "Pinky" Fortner. Click on the "link" to go to share a favorite memory or leave a condolence message for the family.